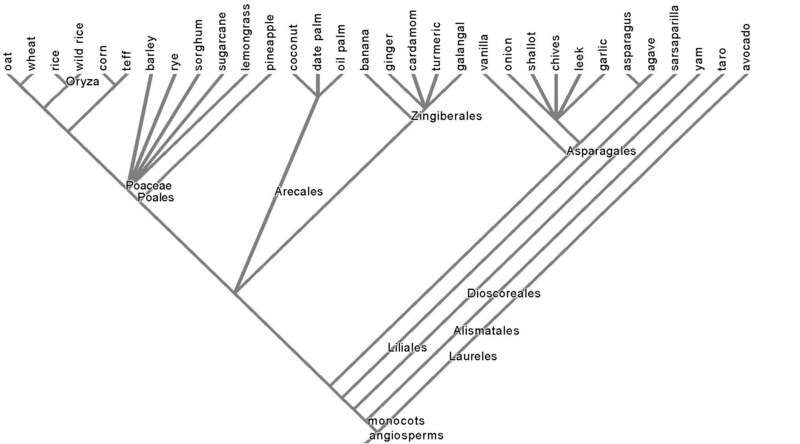 Here we will present the food tree of life using phylogenetic trees . This section is meant to be complementary to the outline view of the food plant tree of life, which contains more plant taxonomic information than can fit on the trees and will contain links to our blog posts about species in our list. Branch points on the tree are called nodes, which represent speciation events, the separation of one group of organisms from the rest. Taxa that are connected by a single branch point are sister taxa. All the descendants from a particular node form a clade. The more nodes separating two taxa, the more distantly related they are. Sometimes the branches of the tree are drawn to scale to reflect the age of the nodes, but usually—and here on this page–they are not. The length of the branches and the arrangement of taxa names on the pages are chosen for convenience or arbitrarily. 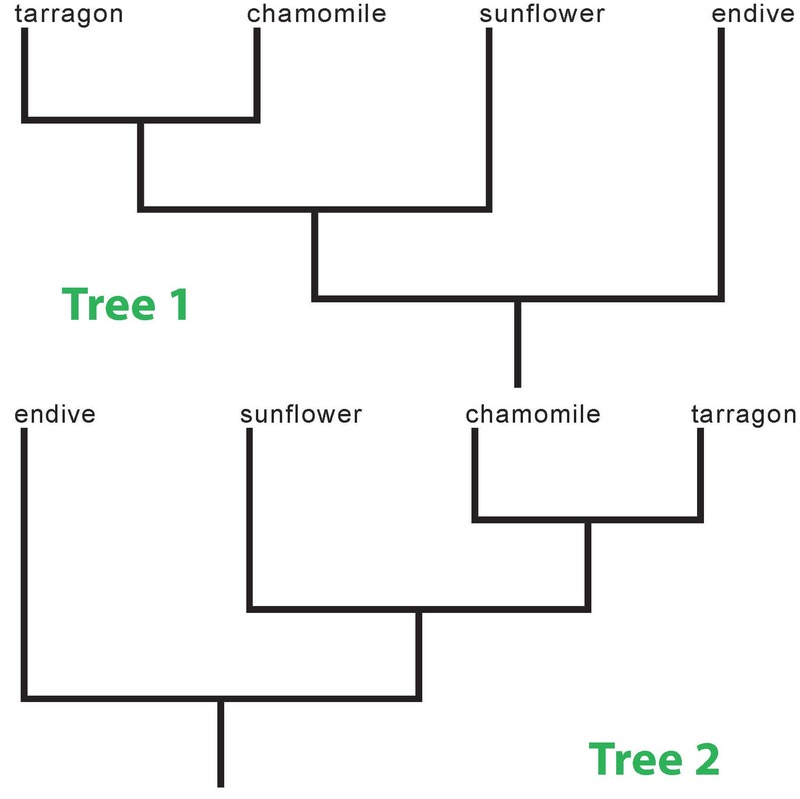 Thus, the two trees in the example above (Tree 1 and Tree 2) represent the same evolutionary history. The two trees are simply drawn differently. 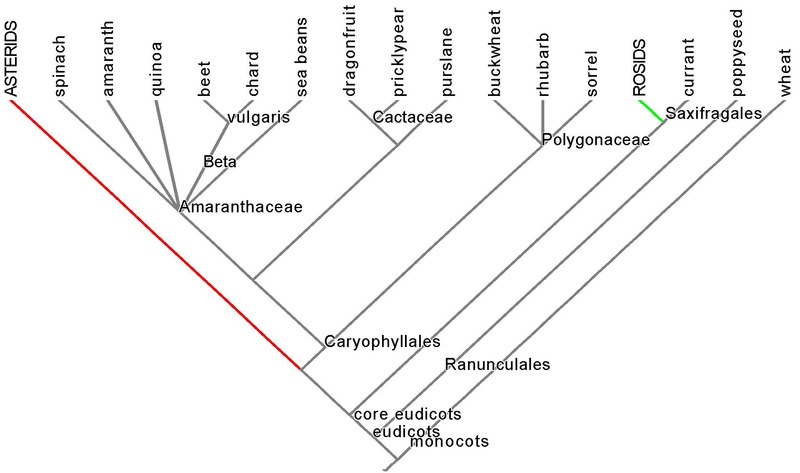 The major clades on the tree are not equally represented in the human diet. Like the diversity of plants on the planet, our diet is heavily skewed toward the more recently derived angiosperms–the monocots and eudicots. Of the oldest clade on the embryophyte tree–the bryophytes, ferns and fern allies–the group of plants that split from the aquatic green algal ancestor and began the colonization of land, our diet only occasionally includes a few species of ferns, eaten in their early expanding “fiddleneck” stage. The next oldest major clade, the gymnosperms, the first seed plants, supplanted the bryophytes and ferns for dominance on the planet starting around 300 million years ago and reigned until the angiosperms diversified and surpassed them for diversity and geographic dominance around 100 million years ago. The 700-900 species of extant gymnosperms, most of which are coniferous trees and shrubs, constitute less than 1% of modern plant species diversity and are the last representatives of a clade that has seen its golden age on the planet pass. Of those modern gymnosperms, our diet includes only pine nuts, juniper berries, the odd spruce or pine needle tip, cycad nuts for the Chamorros people of Guam, and leaves and nuts of Gingko biloba, the last surviving species of a once mighty genus saved from oblivion by the effort of Chinese monks over the last several thousand years. 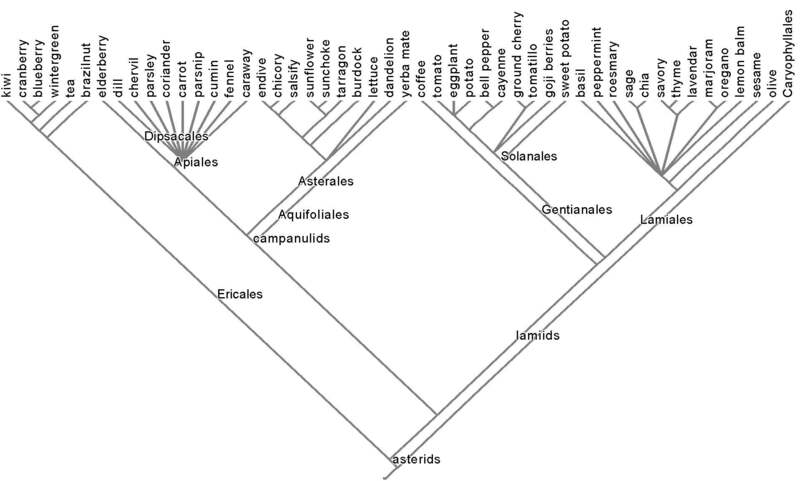 The “starburst” of species all originating from the Laureles order node on the tree is called a polytomy, a clade of unresolved phylogenetic relationships. Our best guess so far is that all of those species in the polytomy belong in the Lauraceae family, but within the Lauraceae the relationships are unclear at present. 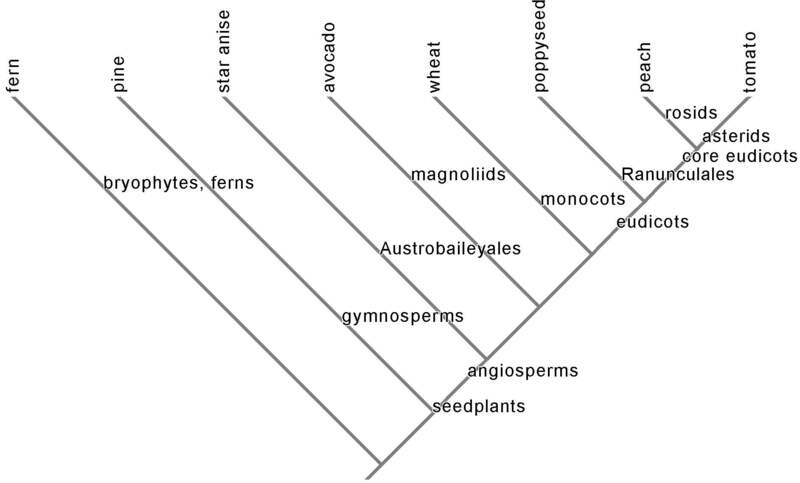 The next big evolutionary divergence in plants after the evolution of the early angiosperms was the splitting off of the monocots from the rest of the angiosperms, creating the two most recent major clades of angiosperms: the monocots and eudicots. The monocots are a large clade, accounting for about 18% of known plant diversity. As the clade containing the grass family, the Poaceae, which boasts the grains wheat, rice, corn, rye, barley, oat, sorghum, wild rice, and millet, the monocots arguably constitute the most nutritionally important clade on the planet. The monocots also contain the plants with the biggest and smallest seeds on the planet–the palms and orchids, respectively, represented on the tree by coconut (a palm) and vanilla (an orchid). 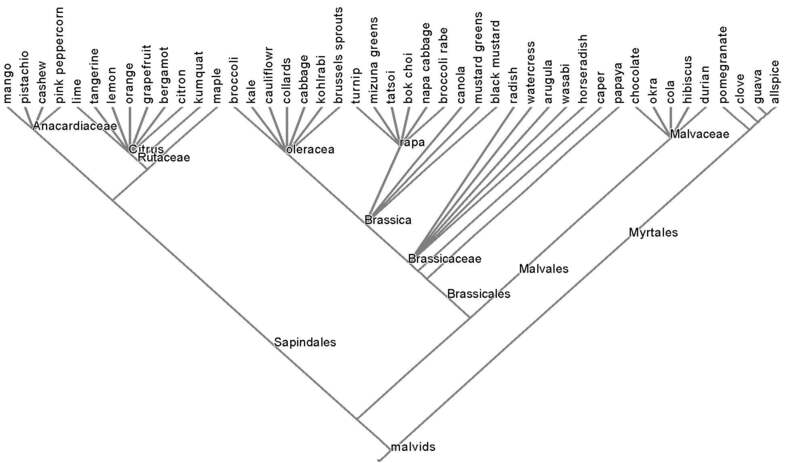 The major monocots in the modern human diet are on the tree below, with the avocado as an early angiosperm outgroup. The orders are labeled on the branches, as is the family Poaceae and the rice genus Oryza. The eudicots are a huge group of plants, constituting 70% of extant plant diversity. Taxonomists call five clades that diverged early in eudicot evolution the basal eudicot orders, of which only one, the Ranunculales, includes something that we commonly eat: poppy seeds. 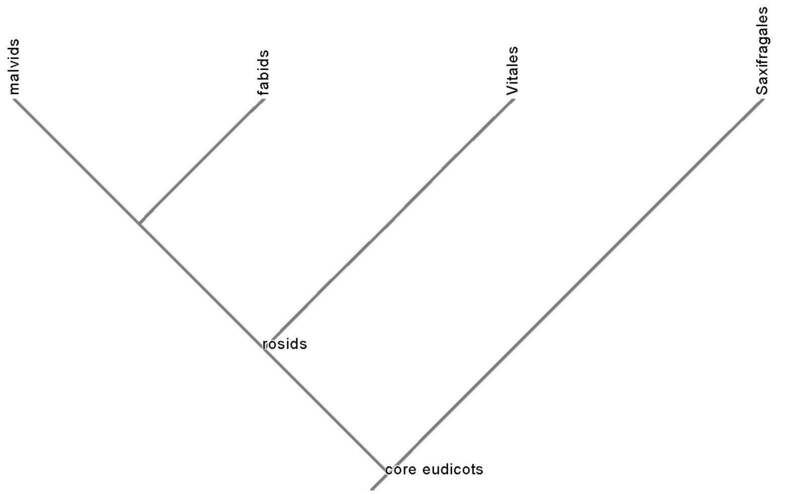 The more recently derived eudicots are called the core eudicots, most of which are members of two large clades, the rosids and the asterids, each of which is shown in the tree below collapsed to a single colored branch. 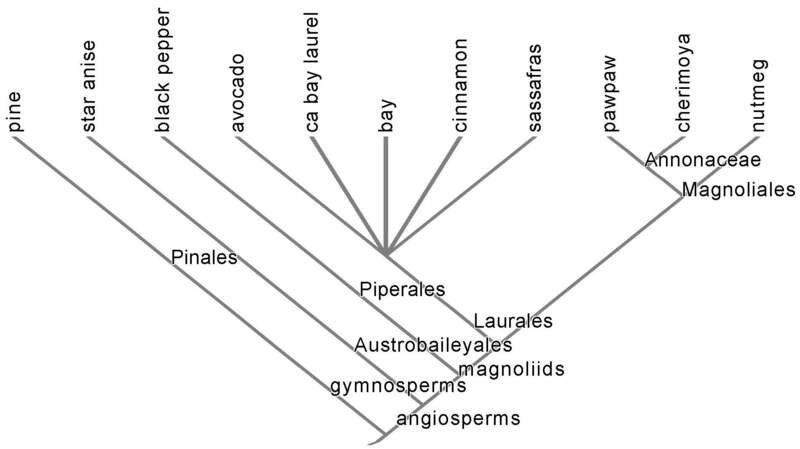 The phylogenetic tree of the food species in the asterids is shown below, with the order Caryophyllales as the outgroup. Our tree includes three major clades of the asterids: the order Ericales, and the two large clades named the lamiids and the campanulids. The rosids account for a quarter of angiosperm diversity. Three major rosid clades contain food species: the order Vitales, which includes grapes, and the malvids and the fabids, both of which are huge. The malvid tree finishes our whirlwind tour of the food plant tree of life! There are 172 species on our initial list of plant species in the human diet. Though hardly an exhaustive list, it certainly includes the plants primarily responsible for feeding the global population. Even if the number of species on this list were doubled or quadrupled it would still only represent a miniscule fraction of the estimated 315,000 plant species on the planet. 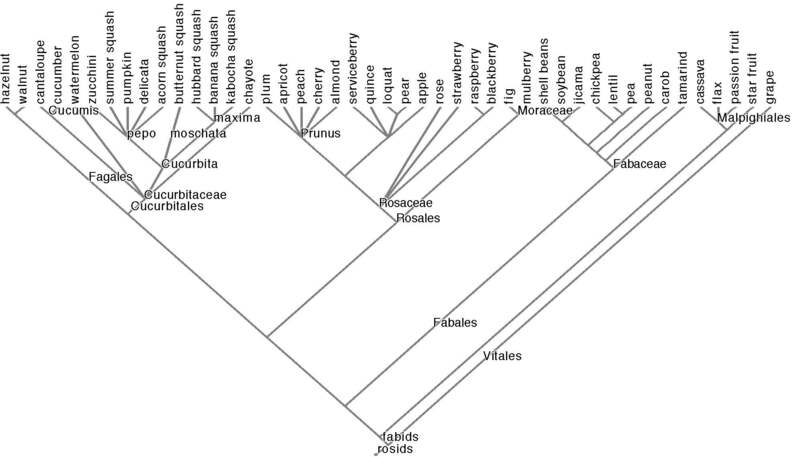 This small sample nonetheless is spread across most of the major clades on the plant tree of life. Every branch has a story, something consequential for the species in its clade. Keep reading the blog as we upack this rich history of our food plants. I bet they would be very excited to have a food phylogeny! So glad you like the blog, Will, and many thanks for the onezoom suggestion. Great to hear from you! This blog is a wonderful idea, thank you for your efforts. Something seems amiss in the monocot tree: corn (maize), sorghum, and sugar cane are all in tribe Andropogoneae, but separated on the tree. Likewise, wheat, barley, and rye are all in tribe Triticeae. Grass Phylogeny Working Group (2001) Phylogeny and Subfamilial Classification of the Grasses (Poaceae). Annals of the Missouri Botanical Garden 88: 373-457 gives an overview, but there have been some more recent updates. Thanks for the catch! I’ve got it right in the gluten post (https://botanistinthekitchen.wordpress.com/2012/12/12/a-brief-history-of-gluten/), where I introduce grass phylogeny, but I’ll need to go back and fix the Poaceae topology here in the monocots. Thanks for reading! Ahh yes, the Kellogg article is also probably less dense than the GPWG. It’s a great read. We’re by no means done with the grasses, so the Kellogg article will probably make another appearance, and I’ll expect you to keep us on our toes! I’ve juste discovered your blog : a really original and exquisite way to study botanics, thanks a lot ! I plan to use some features with my students (I’m a teacher). 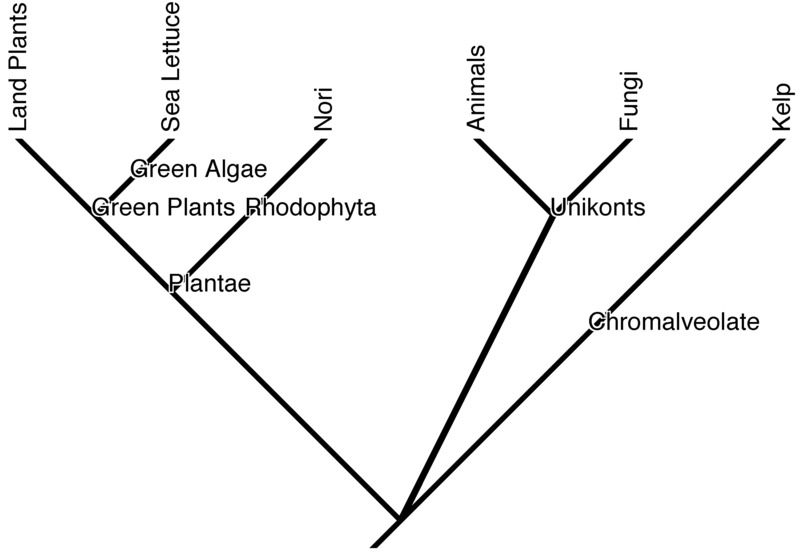 I noticed a bug on “The Tree of LIfe of human edibles” (second figure of this artice) : kelp is actually more closely related to the [nori, sea lettuce, land plants] group (which are Bikonts) than to the [fungi, animals] group (which are Unikonts). But again, great job ! Thank you so much for reading, Céline. We would be delighted to have our work used for teaching. What level? Please do cite us if you use our materials in the classroom, and do let us know how it goes. As for the eukaryote phylogeny, I’m glad you drew my attention to it, because there was a mistake, but it’s not the one you describe. My source is the Tree of Life project, which compiles the most up-to-date information about phylogenetic relationships. Their eukaryote tree (http://tolweb.org/Eukaryotes/3) indicates that there is not enough information at the moment to resolve the early branching order between Plantae (which includes land plants, green algae with sea lettuce, and the red algae with nori), the unikonts and the Chromalveolates (which includes the brown algae with kelp). Therefore my topology now shows these three major branches as originating from the same origin–a polytomy. Modern systematics often dissolves older classifications like “unikont” and “bikont” or changes them to include fewer or more organisms than was previously thought. Hi Jeanne. I’m a biology teacher at the University of Marseille (France). I would like to use some of your stuff with a group of students who are training to become hign school teachers. I was looking for “new”,” original” examples to illustrate convergences in evolution, and I will of course cite the source (I hope the students will come enjoy your site on their own !). Please do keep us updated on the effectiveness of using our material in the classroom–sounds great! And thanks for the eukaryote phylogeny reference. It looks like a good paper, but there are lots of individual papers that are good and make specific hypotheses about big clade topology. Consensus trees like TOL’s are definitely conservative, but I’m going to keep it that way for a while at least. Vexing, though, yes, that TOL hasn’t been updated since 2009. I stumbled onto this blog while trying to educate myself on the basics of edible plants. My objective is to better understand what we humans are actually eating and how these foods came to be. Although I find most of the information available here to be fascinating (Banana’s don’t grow on trees? Ok… Interesting!) I fear that I lack the basic knowledge required to appreciate most of the material presented. Could you recommend some material (online course, documentary, book, etc.) I could consult to educate myself about the very basics of edible plants (evolution, purpose, classifications, etc.)? Thanks for the commentary, Jean-Francois. Our goal is to provide enough information to make all of the material in our essays understandable to a general audience. We sincerely appreciate getting feedback about how well we are attaining that goal or where we need to communicate more effectively. You might start with Botany for Gardeners or Botany in a Day for quick, general overviews. I also wanted to thank you for this fine post. I am teaching an undergraduate food/agriculture course to non-scientists, with the goal of having the students appreciate plant agriculture. I find non-biologists know little about the naming/classification of organisms–but being able to name an organism is key, if one wants to eventually appreciate biodiversity (and also loss of biodiversity). This post, is written at a level that I can use. (Yes, I do cite my sources for class notes.) I do hope you are able to keep up your posts, you must be really busy. We love hearing about how the work is used in the classroom, Margaret, and whether or not we’re effectively communicating with a general audience. Your course sounds really cool. I’d love to see your syllabus. Thanks for writing and for citing us! Thanks, Margaret. As Jeanne says, we love that our work is useful to teachers. Our passion is botanical education. And we have some posts in the works, don’t worry. Wonderful, informative post. I’ve been sharing it with numerous fellow plant nerds. I did note one little misspelling. The nitrogen fixing genus of bacteria associated with legumes is properly spelled Rhizobium. This is sort of a weird question, but are bananas and corn at all closely related? I bought a banana blossom because it looked interesting without knowing what it was. It looked more like an ear of corn than anything else, and when I opened it up, there was a little similarity to corn– lots of little subunits sited parallel to each other. On the other hand, the subunits were leafy not starchy, and in rows at the bottom of the leaves/husks rather than on a central cob. Anyway, convergent evolution or relatedness? Or both? Corn and bananas are both monocots. You can read our article about them here. An individual corn kernel is a fruit, just as an individual banana is a fruit. I don’t–yet!–know about how different monocots arrange their fruits in whorls on a stem axis. Great question! Fantastic post (even if I’m arriving later in the presentation). 2) That all nitrogen-fixing plants, whether hosting Rhizobium or Actinomycetes, are fabids. Beautiful phylogenetic trees! I wonder what they would look like if they were all combined? Wonderful resource. I teach high school botany and this is a great way to have students think about human evolution and plant evolution! Glad it’s working for you in the classroom! I’m thrilled that you are using the blog in the classroom. We always keep other educators in mind as we write, so it’s great to get this feedback.